Engagdet today has a post called “My So-Called Laptop” in which their writers talk about their very first laptops. This made me think two things: 1. Most of their writers are very young, using Pentium class or higher bought within the last 10 years, and 2. I loved my first so-called laptop. I truly say “so-called” because it was definitely not a laptop. It needed a nice, stable platform to rest on because it was Heavy. They were technically dubbed “portables” but everyone called them a “luggable.” They also did not run on batteries, as no battery made at the time could have powered that thing for more than a few minutes. 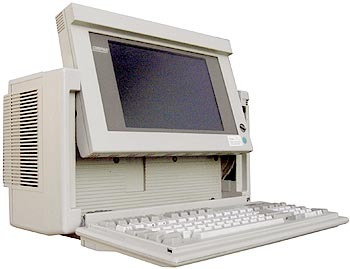 The one I had was a knockoff (a locally assembled version made by EDP Computers in Eau Claire, WI) of a Compaq Portable III. It had a bright red gas plasma screen and detachable keyboard and always drew raves. The 20MB hard drive was SWEET, though it made a ton of noise. I used to love watching that green light that let me know it was doing its thing. This thing ran DOS 2.0, not Windows. It was a 286 with 640K Ram. The adventurous among us may have installed a bit more RAM and then tried to load QEMM in order to get …what was the name of that multi-taking software? Ah yes, DesqView. I never saw the point of running more than one app at a time. I got a *ton* of work done on that baby, as I’d lug it from client to client and sit there on-site to make the changes rather than take a 5 1/4″ diskette with me back and forth (we didn’t use modems much back in 1988 as it was rarely worth the effort to get the 9600 connection going).